Each year, around this time, I make two lists – one content and one classroom related – of things that I’d like to have done before I leave for summer break. Then, as the days (and my motivation) dwindles, I take some pride in being able to cross a couple of items off each day. Sometimes I finish everything, sometimes I don’t. But, regardless, I’m a lot better off for the next school year than I would be otherwise. 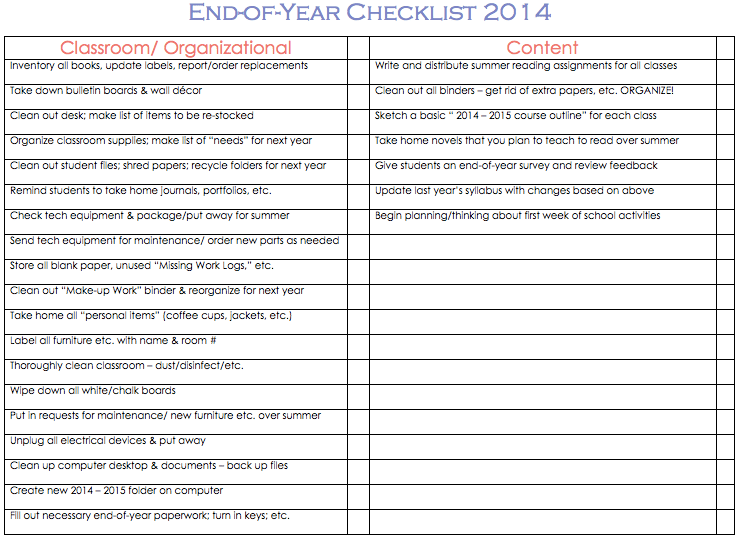 Below are my lists and a link to a printable/editable version in Word. I’m sure I forgot some things and will need to add/edit as I remember them in the next couple of weeks, but I think this is a good start. What would you include on your list that I left off of mine? Please share in the comments so we can all update! Now, go forth and make lists! This is such a great list! At this point in the year, I find myself thinking all about next year! And our school does a crazy SOL schedule where we see kids for 3 hours at a time- yikes- but during my 3 hour planning, this will come in handy! Thanks! LOVE that it is almost the end of the year.